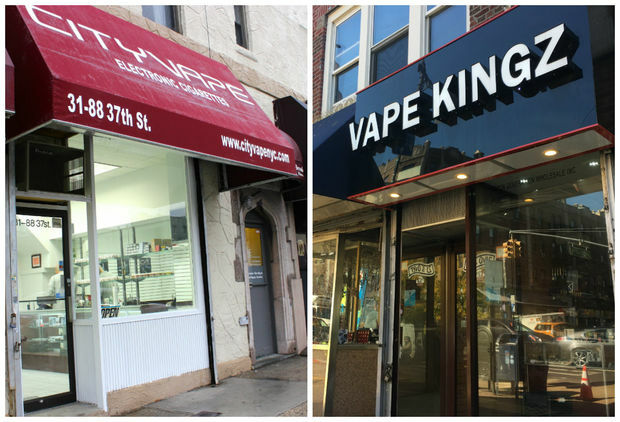 City Vape, left, at its old location on 37th Street (the store is now located at 29-20 23rd Ave.) is suing rival store Vape Kingz at 36-20 30th Ave.
QUEENS — This rival vape shop is trying to make its competitor go up in smoke. The owner of an Astoria e-cig store is suing a competitor for waging "a continuous campaign to interfere" with his business by fraudulently racking up charges on his company credit card, trying to bribe vendors into divulging information about his operation, and even tearing down advertisements for his shop to replace them with ads for the rival store, a new lawsuit says. Spiro Dogaris, the owner of City Vape at 29-20 23rd Ave., filed the suit in a Queens Supreme Court Wednesday against Vape Kingz, another e-cigarette shop in the neighborhood at 36-20 30th Ave.
Dogaris claims that in August, Vape Kingz employee Daniel Fagadar impersonated him while on the phone with an e-liquid manufacturer that reached out, pretending to be the City Vape owner while placing an order for $5,000 worth of vape liquids on Dogaris's company credit card, according to the suit. When Dogaris noticed the charge, he contacted the manufacturer to dispute the purchase, later listening to a recording of the phone call between Fagadar and the vendor and identifying his rival as the one who fraudulently made the order. On other occasions, representatives of Vape Kingz contacted other e-cig vendors and attempted to bribe them into releasing "confidential information" about Dogaris's business practices, the lawsuit alleges, without providing additional details. The suit also claims the rival shop would send staff to remove City Vape advertisements from public places and replace them with ads for Vape Kingz. The lawsuit seeks a restraining order against Vape Kingz and at least $5,000 in damages. An employee at Vape Kingz who did not provide his name declined to comment on the case, saying the store had yet to be notified of the suit. During a brief phone conversation, Fagadar claimed that he was also unaware of the suit. He said he does not currently work for Vape Kingz and denied impersonating Dogaris or placing orders on his behalf. "I didn’t order anything," he said. Fagadar said that he and Dogaris used to be business partners and had been working on an e-juice line together, but that the deal went sour. "He screwed me over," Fagadar said. "He's trying to get money." He did not immediately return additional requests for more information. Taso Pardalis, an attorney representing Dogaris, said in a statement that his client's store "is one of the largest operators in the Vape business in New York City, a burgeoning, unregulated industry." "Whenever you're trying to run a legitimate business and you have bad actors, it becomes more difficult," Pardalis said. "It's just a niche and nascent industry, and it's kind of like the wild west."